A few weeks ago you might have seen us post a video we made as an entry into Starbucks Upstanders contest hosted on Indi.com. 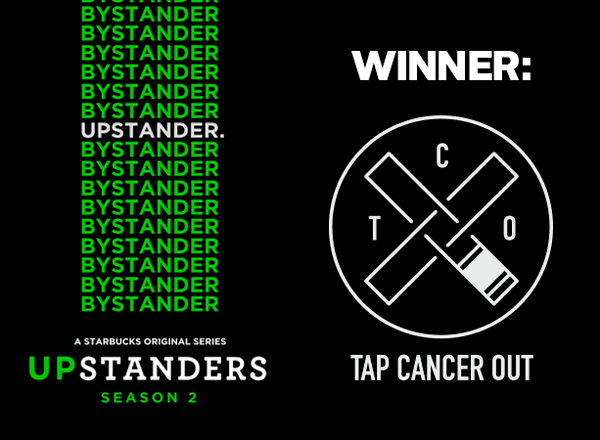 The contest marked the release of Season 2 of Upstanders—Starbucks original series highlighting ordinary people doing extraordinary things to create positive change—awarding more than half a million dollars in grants to organizations (eligible US 501(c)3 non-profits) making a difference in their communities. We had only learned about the month-long contest with about six days left. After holding my teammates hostage and recording a video after class, then editing it until 2:30am, I submitted it the following morning. I knew we had to be a top 40 “buzz getter” in order to be considered a finalist, but what I didn’t know was that 430 other charities were vying for one of those top 40 spots, and we were starting from the bottom. I begged and pleaded with you all. I coerced friends and family to feverishly watch, like, and share the video. And let’s be frank—I probably annoyed you. Well, today I’m thrilled to let you know that we’ve been selected as one of 25 amazing charities to receive a $25,000 grant from Starbucks! You can read the official announcement on Starbucks’ website here. At Tap Cancer Out, we often say that our communication strategy is “radical transparency.” I want you guys to know everything that goes on here. We want you to be part of this ride with us and see how we balance the investment into our growth and the gifts to our beneficiaries. We tell you everything—our successes and our failures. So let me explain what $25,000 means to us. There’s a reason it’s a “grant” and not a “donation.” Grants are typically given for a specific purpose (ex: a research grant), and while Starbucks has given no such expectations, we intend to use it to invest in the growth of Tap Cancer Out and the resources necessary to expand. This investment (yes, I have to be a bit vague with it right now) will allow us to host more tournaments in cities we have yet to visit, like Chicago, Dallas, Miami and more. We’ll be able to expand our reach and hopefully double our impact in 2018. More on that later, but for now, I really wanted to thank all of you who helped us accomplish such a crazy feat, from those who appeared in the video to everyone who watched, liked, and shared one of our video submissions. The BJJ community is truly amazing. Also, they shot a pretty cool photo with all the charities names on their new holiday cups. If you look closely, Tap Cancer Out is in the bottom right. Hi-res version here if you really want a closer look.